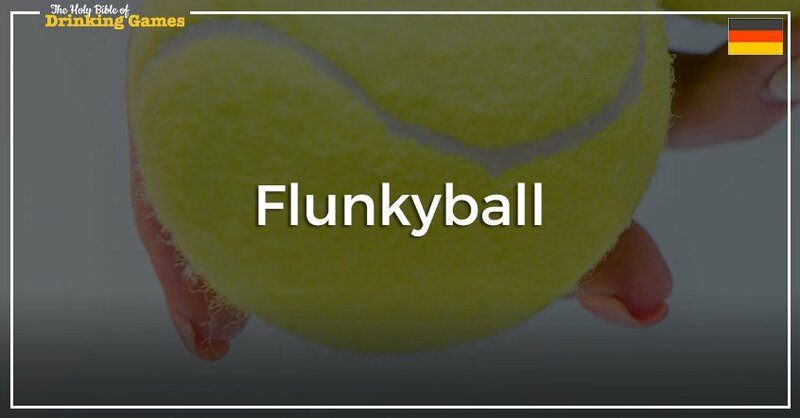 Flunkyball Drinking Game was submitted by Sebastian, Germany. The perfect game that combines “athletics” and drinking. The God of Games believes the Flunkyball drinking game should be a part of the Olympic games! Hand co-ordination, speed, athletic ability, drinking finesse… Just a handful of things important for this game. Sebastian introduced this game to the God of Games in a small hostel in Cairns Australia which turned out to be one of the best games played whilst there. A great game for a group of people who don’t know each other too well. Also a potential icebreaker next time there’s a “corporate team building day”… Or for when you know you can destroy a group of people. Make sure you pick your team wisely. A slow drinker, someone who’d never thrown a ball in their life or someone who isn’t competitive probably aren’t people you’ll want on your team. Someone on your team with good aim! For this game, you will need quite a bit of space as you’ll be running. You’ll need to have two teams but it doesn’t matter if the teams aren’t even. You’ll need to place an empty bottle in the middle of the two teams and ideally have about 10 paces between each team and the bottle. Each team takes turns in throwing a tennis ball at the empty bottle in the middle and when the bottle gets knocked over someone from the opposing team has to run out, set the bottle back up in the middle and run back to their starting spot. Whilst someone is trying to set the bottle back up everyone on the team who knocked the bottle over must start drinking and stop once the bottle is back and the opposing player is back at their starting spot. When players are not drinking all drinks must be on the floor. The first team to finish their drinks get to give the other team a forfeit they have to complete. Split up into two teams. You’ll need an empty bottle and a tennis ball. Teams move to a position where they can place the bottle between the two teams. Both teams can stand 10 paces away from the bottle. Teams will take it in turns to throw the tennis ball at the bottle in the middle trying to knock the bottle over. If the team knocks the bottle over, the opposing team has to run out, stand the bottle up and run back to their spot. The team who knocked the bottle over starts drinking and continues drinking until the opposing team has stood the bottle back up and all team members are back in their spots. The team who finishes their drinks first win and makes up a forfeit for the losing team. When players are not drinking, all drinks should be placed on the floor.